This is a commemoration of the last supper that Jesus spent with his disciples and is celebrated in the following formats as a regular family act of worship. • The traditional form of the Book of Common Prayer (BCP) is used at some of the said mid-week communion services at St. Peter’s and All Saints (3rd. Sunday of Month) See details on the monthly service schedule. 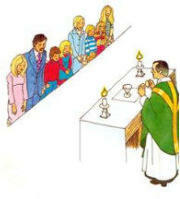 • Common Worship Order 1 is used for the thrice Monthly Parish Communion at St. Peters and at St. Mary’s. The Choir leads the singing of the communion setting and hymns. This service includes a sermon and lasts approximately one hour. Young children from the respective ‘Rise and Shine’ groups join us at the communion following their meeting in Church rooms. • Our occasional All Age / Family Communion at St. Peters (normally second Sunday (but see monthly service calandar) is a simplified and shortened version of Common Worship Order 1, designed for our young people and families to feel welcome. A talk or activity involves the children and modern music is used. The service lasts around 50 minutes. Held monthly on the fourth Sunday of the month at St. Mary’s Felmersham. This is the tradditional Morning Prayer service from the Book of Common Prayer. This traditional benefice service with a sermon and using the Book of Common Prayer is held weekly at St. Peters at 6.00 pm. Hymns and canticles are sung. An occasional full Choral Evensong is held with a joint Benefice Choir. Following all our Sunday morning services at St. Peter’s,St. Mary’s and All Saints (monthly Morning Worship) we enjoy coffee / refreshments and fellowship together. For further details of services at St. Mary’s Felmersham click the link.